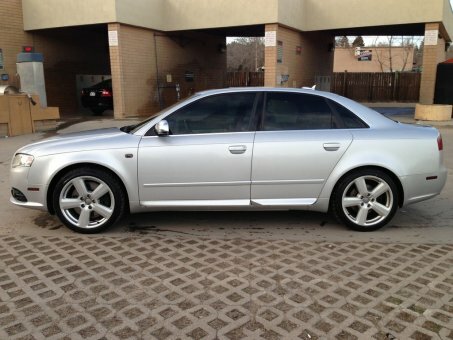 2005.5 AUDI S4 JUST REDUCED from 11900!! -Quattro AWD -4.2l V8 --340hp -Automatic with paddle shift -Silver exterior -Black leather Recaro seats with silver suede inserts -Bose sound system -Factory navigation system -Front and rear heated seats -CLEAN TITLE -- no accidents -- all original paint -Well maintained by a reputable shop. -Has 35% tints -Has winter and summer wheels: Summer wheels are 19 inch OZ Superturismo LM's in gunmetal -2005.5 year, titles as a 2005, but has the 2006 and newer body style aka B7.